Upcoming Events – UNIX Stitch Machines Pvt. Ltd.
Unix Stitch Machines Pvt. Ltd, which started its operations in year 2005, has offices in Surat, Ahmedabad and New Delhi. Unix is one of the most innovative and creative companies emerging in computer embroidery industry. The company has positioned itself as a pioneer technology supplier in the embroidery industry with a distinctive identity. An outstanding reputation for customer service coupled with management commitment to quality has made UNIX, the preferred supplier for a quality embroidery machines. Besides, looking at the growing customer demand for value addition in last few years, the company has successfully added rhinestone machine and digital printing machine to its portfolio. It has also started offering weaving machines to its customers recently. 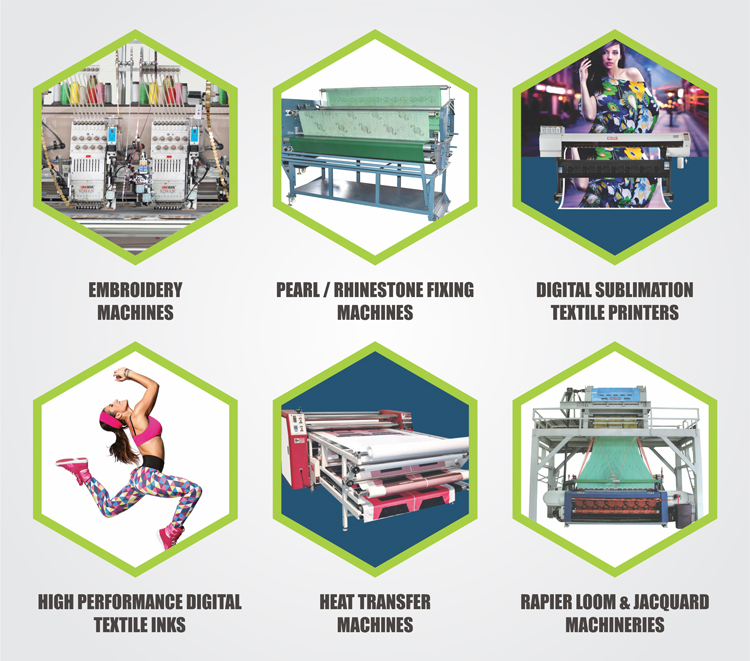 The company will be participating in India’s most awaited textile technology show ‘GARFAB-TX,’ taking place from 5th- 7th April, 2019 at SIECC, Surat. This edition Unix is committed to overcome the challenges of textile industry with its latest innovative technologies to be presented at the largest exhibitor space i.e. 700 sqm mtr Stall (No. A3 and A4) at the show. At this show, the company will be wide range of technologies at the exhibition, which include: 1400 RPM high speed embroidery machine, 3 Dimensional Embroidering, Beads embroidery, Beads + Beads combined, Chain Coiling & Chain Taping machine, Sequin Embroidery, Multi-Cording Embroidery machines by Zhuji Maya; 4-Head Digital and 3-Head Digital Sublimation Printers by Fedar; Digital inks by INKTEK; Pearl with Sequin Embroidery machine, Shape Pearl, Rhinestone machine, Roll to roll machine, Single Head Stone, Laser machine by FZY; Rapier loom, Jacquard, Heat Transfer machine by UNIX. The company requests industry people to spare some time and visit its stall to understand more about the features and benefits of above mentioned new innovations, which have been developed as per fast changing customers demand and upcoming fashion trends.